Starting from pole position, Marc Marquez (Honda) looked ready to extend his perfect record at COTA by taking a sizeable lead in the first half of the race earlier today. Disaster struck, however, when Marquez low-sided (unhurt) and was unable to re-start his bike. This opened the door for several riders behind, including Valentino Rossi (Yamaha) who immediately assumed first position and looked poised to take the win. Suzuki’s Alex Rins, however, closed his gap on Rossi, and made a pass with four laps remaining. Rins held on to take his first win in MotoGP, ahead of Rossi in second and Jack Miller (Ducati) in third. With a fourth place finish today, Andrea Dovizioso (Ducati) takes over the championship points lead from Marquez. Follow this link to full race results. For additional details and points, visit the official MotoGP site. Looks like the rear tire couldn’t get any grip on the painted surface. It kept sliding across the paint. Riders can typically push start with the help of corner workers. But the painted surface didn’t seem to offer much grip this time. is it possible to push-start a 300 hp bike that’s geared for 205? if a superfit/motivated rider can’t do it, can he expect deconditioned cornerworkers to do it for him? It was really nice to hear Rins talk about beating Rossi, his childhood idol. That’s true. Does anybody know what happened to his bike? At least it wasn’t the chain this time. It amazes me those guys are so little they can barely pick up a 240 pound bike. maybe Honda’s next attempt at a swingarm ‘strengthener’ might include a chain guide…..
That makes me surprised that regular readers/commenters here profess to want liter size 4 cyl street bikes that weigh under 400 pounds. At 345 pounds, GP bikes barely make it and they are full of titanium and carbon fiber and have no batteries, lights, mirrors, turn signals etc. Maybe you guys could post pictures other than the winners in the lead on the home page. Spoiler alert and all that. Once again, let’s go thru this slowly and carefully. You Can Avoid This And Other Sites That Report On Racing If It Is That Important To You. 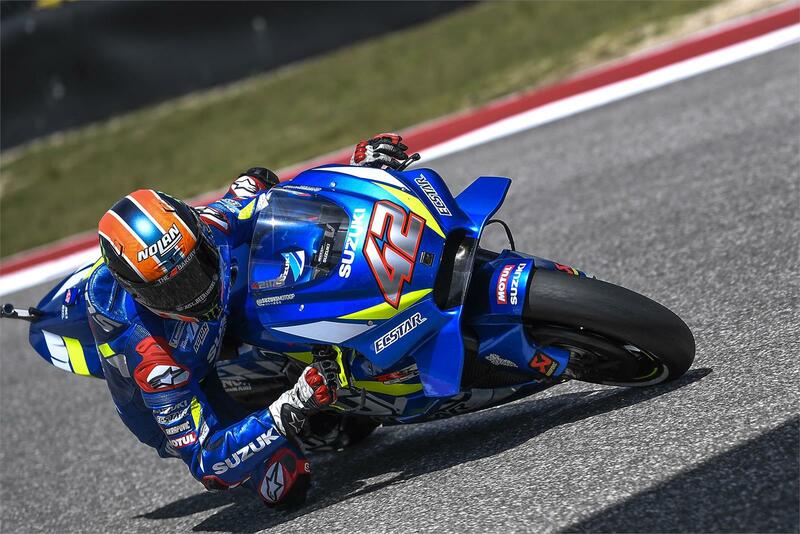 Really glad to see Rins and Suzuki take win! Congrats Rins! Beat that guy who could have been your dad:) And congrats Suzuki! Love it! A bit of a shame it had to end that way for MM at “his” track, but I guess he was giving it his all, not just safing it. On the flip side great win for Rins/Suzuki and great ride by Rossi. Great comeback from 17th for Dovi. Again, draconian ride-through penalties for the crime of creeping ahead 3 inches at the start. Why did they bother to create the long-lap penalty in the first place? What will they use it for, if not something like this? Viñales lost 4 seconds and 5 positions when he mistakenly used the long-lap area, which seems like a completely reasonable punishment for a “jump start”. Crazy to think such a small infraction has a penalty severe enough to torpedo the entire championship for whoever suffered it. I can understand a ride through for a real, on-the-power jump start. Even a fraction of a second more on the gas can yield a huge advantage into turn one. It can also be really dangerous coming from someone starting on the third row or further back given how quickly the bikes accelerate. But these recent “jump starts” are carrying heavy penalties for movement that certainly yields no advantage. Maybe they need a new infraction – movement before the start – that gets the long lap penalty? Or maybe just keep it like it is and nobody moves before the lights go out. It never seemed to be a problem in previous years. The only jump start penalties I can recall were for actual powered jump starts, and they were pretty rare. We’ve already had three jumps in the premiere class alone (there have been some in the other classes too) called at the very beginning of the season. Are the riders just more on edge this year, or has the FIM just gotten more rigid in its enforcement? I think in the future the long lap penalty will be the one used for a jump start instead of the ride through. A 25 second penalty for jump creep is just too much. If there is a voodoo doll stuck full of pins anywhere, it probably looks more like Jorge than Maverick. Maverick’s troubles are mostly self-inflicted. Jorge keeps running into the oddest of mechanical DNFs. Or aren’t trained to do it right. Look for that gal that demos it with things like Gold Wings online. IIRC, Marc not only picked up the bike, but he flipped it over to the other side. They are not big guys by our standards, but they do seem to be quite fit.